On October 20th, I enrolled on Magic Online’s Vintage Challenge, a scheduled weekly Vintage tournament. Because the tournament gets about 48-62 players per event, it is the largest regular Vintage tournament in the world. Interestingly, attendance through 2018 is noticeably higher on average than attendance in 2017. Very few of these tournaments get less than 50 players in 2018, while they were routinely sub-50 in 2017. The Vintage Challenge is also easily the most competitive regular Vintage tournament, as it features VSLers, former Vintage champions, and regular Vintage grinders, many of whom compete nightly in the Vintage Leagues. It is an excellent proving new ground for ideas, and a testing ground for established decks. It is also a remarkably useful signal of the state of the Vintage metagame and the direction of the metagame. It reflects the overall metagame trends, but also predicts larger paper tournaments, since it reflects global competition. For me, the predecessor tournaments, the Power Nine Challenges, were appointment Magic, and the transition to the Vintage Challenges diluted my interest and enthusiasm for competing regularly, as a weekly event is more strain than my schedule can bear. Although I only played in 2 Vintage Challenges in 2017 (May 27 and June 17, getting 2nd place), I have now managed to play in 4 Vintage Challenges this year so far (May 18, May 26, October 6, and October 20). The weeks leading up to the North American Vintage Championship are especially interesting because they prefigure that marquee paper event. For that reason, I thought it would be valuable to conduct a full metagame analysis, and not just a Top 8 or Top 32 breakdown. It has been a while since Ryan Eberhart and Matthew Murray reported such an analysis. 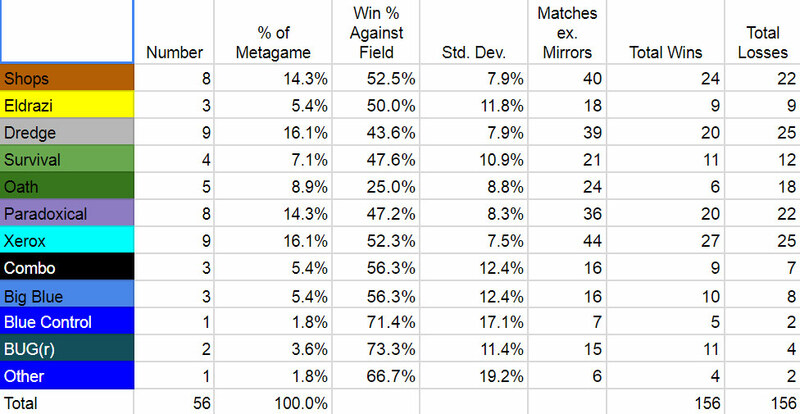 In fact, the last Vintage Challenge metagame report, which included a complete breakdown of decks/archetypes and match-up win percentages was back in April. In response to my last article, some players complained that Top 8 data is no substitute for win percentage data. For those reasons, I thought I would do that here. The night before the tournament I got the spreadsheet template from Matt Murray, and as soon as the tournament ended, I spent the next few hours filling in the spreadsheet, entering every match result, every decklist, and every player name. It was extremely tedious, but ultimately worthwhile. I justified the effort and motivated myself by telling myself that this was not something I would do again, but it was something I should do at least once, just to see how it worked. I am pleased to share my effort with you. If you read my latest article on this site, or listen to the SMIP podcast, this metagame is oscillating in some interesting ways. First of all, the most shocking feature here is the large percentage of Dredge decks. It is tied for the largest share of the metagame, with 9 copies, or over 16% of the field. Dredge is a weird deck that goes in ebbs and flows. It rises high and falls low. This tournament exemplifies that pattern. But prevalence does not entail success in Magic. Just one Dredge pilot made Top 8 from the entire field of Dredge players. Second, Paradoxical Outcome (PO) and Xerox decks are nearly tied, as they often are, as the most popular decks in the field, along with Dredge, at 8 and 9 copies each, respectively. Both decks come in many flavors. PO comes primarily in Esper, although there are lists with green for Sylvan Library/Managorger Hydra, and others with Oath of Druids, and sometimes those that are just 2 colors. PO also has a lot of tactical variety. Some lists lean heavy in to Night’s Whisper, and some others have zero Night’s Whisper but use Mystic Remora. The corpus of the lists are often very similar, though. Xerox decks are even more varied. The most recently successful lists are RUG, with a pair of Young Pyromancers and featuring Ancient Grudge. Jeskai Mentor is also very popular with this archetype, although UR Delver sometimes appears as well (often packing Wastelands). Mishra’s Workshop decks are less varied. The vast majority or Workshop lists are standardized around lists Montolio ran in either last year’s Vintage Championship (which he won, with Steel Overseer) or at SCGCon (which he also won!). There are some variations at the edges, but the bulk of the deck is fairly standardized around Ravager/Ballista/Overseer/Foundry Inspector, and Sphere effects. Workshop Aggro is often the most popular single deck in any environment, but it also ebbs and flows. Here, it is only 14.3% of the field, with 8 copies, but it ended up winning the tournament. The next most popular deck in the entire field – making it the 6th most popular deck in the field – with 4 players at over 7% of the field, was Survival. This is notable. Survival popped out of nowhere to win the Asian Vintage Championship earlier this year, and then spiked to 9% of Top 8s in the Vintage Challenges in August, before dropping off again. Well, it’s back! Not only was it 7% of the field, but it got 2nd place in the October 13 Vintage Challenge, and Top 8’ed this challenge as well, showing that it has staying power as a competitor in this environment. Now that we have a feel for the metagame, how did these decks perform? From a purely aesthetic perspective, it was a beautiful Top 8. It was diverse and interesting. It was Workshop Aggro, BUG(r), 2 Paradoxical Outcome control decks, Survival, Dredge, Landstill, and Dark Petition Storm. The one “blue control” deck was Landstill, which also made Top 8 by going 5-2 in the tournament. Dark Petition Storm had a surprisingly strong showing in the hands of three players. Although one player dragged them down by going 0-3 with a Grim Tutor deck, the other two DPS players went 4-2 and 5-2, making Top 8. If we remove the very suboptimal Grim Tutor list, DPS had a 69% win percentage in this event. I couldn’t tell you exactly why, since, as you will see, it has a very bad Paradoxical Outcome matchup, but I suspect it was great fun for the pilots. I wouldn’t make too much of Big Blue’s 56.3% win rate, as it was only two games above .500. Again, small sample size. The “Other” deck, as well, was a 2-Card Monte deck, which finished 4-2. Probably the most reliable data points are those for Shops, Dredge, Paradoxical Outcome, and Xerox decks. That’s because there are 40, 39, 36, and 44 matches in our sample, respectively. Workshops finishing with a 52.5% win percentage is no big surprise. In fact, that’s almost exactly its win percentage in April. It should be noted, however, that Workshop Aggro ended up winning the tournament. So, a 53% overall win percentage is perfectly consistent with putting one player in the Top 8 who wins the entire tournament. Dredge’s win percentage is notably low, at 43.6%, with a large sample of matches, having finished 20-25, excluding mirror matches. Paradoxical Outcome was the only archetype to put two players into the Top 8, but, overall, it had a sub 50% win percentage. But that only equated to 2 matches below .500. Xerox was the reverse mirror of PO’s results. It was tied for the most prevalent archetype in the field, but was 2 matches above .500. Interestingly, no Xerox decks made Top 8. Survival made Top 8, despite having a slightly losing overall match win percentage, in the hands of four different pilots. The worst performing deck, however was Oath. Most of the Oath decks were Kelly-style Oath, but a few were more random variants, like Punishing Fire Oath and Saheeli Rai Oath. Nonetheless, it put up an abysmal 25% win rate, going 6-18. The matchups are where things get really interesting, but also tenuous in terms of inferences because of small samples. Read on, but with caution. • Xerox is good against PO. The 60% win percentage of Xerox decks over PO is in line with the 62% win percentage found in April. On the other hand, Xerox struggles mightily against Dredge, both here and in April. • Eldrazi is even better against PO. It’s a very small number, but both here and in April, it was undefeated against PO. On the other hand, Eldrazi is a huge underdog against Workshop Aggro. That’s Eldrazi’s biggest weakness. • The 100% or 7-0 match win rate of Xerox over Workshop Aggro has to be anomalous. Unless Jeskai sporting Shattering Sprees and RUG with Ancient Grudges are just that good against Workshop now, it’s certainly strange that Workshops didn’t win a match in that matchup. • Paradoxical Outcome went 0% or 0-5 in matches against Workshops. While I certainly don’t think PO is a huge favorite, I don’t think it’s an underdog, and certainly not a large one. In April, PO had a 55% win rate over Shops. That sounds about right. • Survival was billed as the PO killer with a bunch of Stony Silence, but its 0% win rate against PO is masked by the fact that they only faced off once. So, I wouldn’t read too much into that. • Oath is also probably better against Workshops than the 50% win rate here suggests, but that can also vary greatly with the Oath package. • Dredge is now a huge dog to PO. Looking over the Dredge lists, I’m not shocked why. The Dredge lists have basically abandoned Force of Will, and now run Ravenous Trap or Leyline of the Void main deck – cards that may be insane in the mirror, but of little value against PO. • Combo can be designed to beat Workshops. The Workshop Aggro plan to clock as fast possible is often not fast enough for combo, and combo’s big mana base and big play effects are really disruptive for Workshops. I am impressed. • The Vintage metagame is pretty well balanced. None of the “big” four or five most prevalent archetypes are crushing the Vintage Challenges. Depending on the week, PO, Xerox, or Workshop Aggro have the most Top 8 appearances, but none are consistently outperforming the other, and none have a consistent 55%+ win rate. • The metagame is paradoxically static and extremely dynamic. 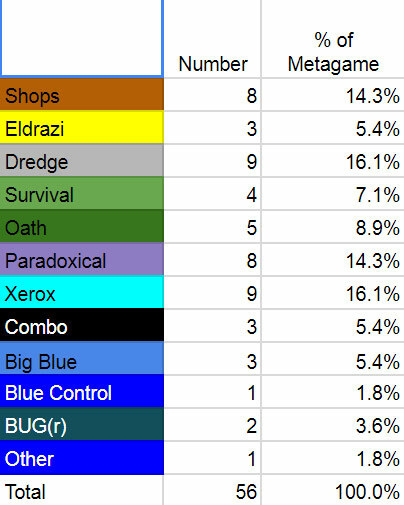 There are large parts of the metagame that persist with regular consistency over time, like Dredge, PO, Xerox, and Workshops, and other parts that are highly variable, like DPS, Survival, Eldrazi, and Landstill. Playing a rogue deck with a smaller presence in the field brings real value, as it means that opponents are more likely to take the wrong line of play. • Survival is also a real deck, and it is has shown it can win, by Top 8’ing this event, and getting 2nd the week before. • New cards are making a difference. Assassin’s Trophy seems like the big winner so far in Guilds of Ravnica, although Niv-Mizzet is also appearing in Oath decks. In the final analysis, I think my prediction for the North American Vintage Championship in my last article still holds. In fact, I wouldn’t be shocked if it looked a lot like the Top 8 from this tournament, with a pair of PO decks, and Workshop Aggro winning again. But I think it will probably look more like the SCGCon Top 8 from a few months back.